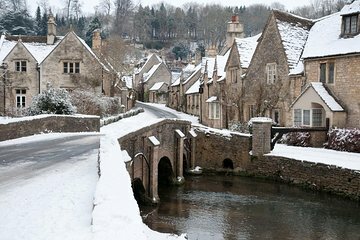 Enjoy a quintessentially English Christmas with this scenic Christmas Day trip to Stonehenge, Bath, the Cotswolds, and Stratford-upon-Avon from London. Traveling by air-conditioned coach with an informative guide, discover some of England’s top attractions at their quietest—without the usual crowds. Marvel at prehistoric Stonehenge from Salisbury Plain, admire the golden Georgian architecture of Bath, savor a classic Christmas lunch at a quaint Cotswolds inn, and visit the charming market town of Stratford-upon-Avon to view where William Shakespeare was born. Unlike similar Christmas Day tours, this one stops at Shakespeare’s birthplace—Stratford-upon-Avon. Depart central London in the morning by air-conditioned coach ,and journey southwest to Stonehenge as your guide shares fascinating facts about this prehistoric monument and the mysteries it holds. The Stonehenge site is closed to visitors on Christmas Day, but you can still enjoy splendid views of the giant stone circle from adjacent Salisbury Plain. Stop here to take pictures free from the usual crowds, and listen as your guide reveals more about the monument. Discover some of the theories for how the stones were transported here and why the circle was built. Continue to the nearby historical spa town of Bath. From your coach, admire the elegant Georgian buildings, built from honey-hued local stone, and enjoy a walking tour of the streets, seeing the glorious Royal Crescent and 18th-century Pulteney Bridge. Then, travel on to the Cotswolds, where rolling hills and stone villages make up one of England’s prettiest regions. Admire the picture-postcard scenery, and pull up at a quaint Elizabethan-era pub for today’s highlight—a delicious Christmas lunch. Settle inside the cozy inn, and feast on a traditional Christmas Day meal of scrumptious roast turkey and rich Christmas pudding for dessert. Accompany your meal with your choice from the pub’s real ales and fine wines (own expense), and finish with a refreshing cup of tea or coffee. Afterward, make your way back to London. Stop in Stratford-upon-Avon, famous for being the 16th-century birthplace of William Shakespeare, England’s greatest playwright. Pass the picturesque childhood family home of his later wife, Anne Hathaway, and stop for photos at Shakespeare’s family home, where he was born in 1564. Your Christmas Day tour ends in central London in the early evening.